while the freighter Hardeep rests in 30 meters in a channel between two islands off Samae San, not far from Sattahip. Pattaya offers a wide choice of well-stocked and safe PADI and NAUI operators with competitive prices. Most of them have offices along the waterfront. Costs average at about 1,500 Baht per day, including transportation, food and equipment. Visitors can windsurf, water ski, sea walk, swim, sunbath, snorkel, sail, go fishing, or take trips to offshore coral islands. They can rent jet ski to explore Pattaya bay and motorcycles and jeeps to explore neighboring beaches such as Jomtien beach just south of Pattaya. Tennis enthusiasts can enjoy themselves at the court in our Condo. Further entertainment includes bowling, snooker halls, indoor and outdoor shooting, archery, kart racing, parasail, bungy jump, etc. Pattaya Elephant Village is on the road to the Siam Country Club Golf Course. The elephants display their forest skills, perform cute tricks and even play football. Daily show time is at 14:30. Panarak park is also on the road to the Siam Country Club and has a tropical garden setting. The park is equipped with fishing gear and a well stocked-lake. There are also restaurants, jogging and cycling paths, boating and water-cycling. Bira International Circuit located at KM14 on Rout 36 to Rayong offers international motor and motorcycle racing. The 2.4km circuit is ideal for Formula 3 races. If you want to experience speed, the circuit is open every day. Jomtien beach is located 2km from South Pattaya and is good for swimming. The beach has become popular for water sports and activities because it has a long straight coastline and there are less boats anchored in the area. 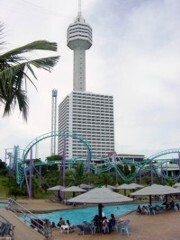 Pattaya Park is between South Pattaya and Jomtien and is a water amusement park with water slides, whirlpools and a large pool for children. It is open from 9:00 to 18:00. Nong Nooch Village is about 15km from South Pattaya and is a Thai village-style recreation park. The entire area is beautifully landscaped with orchid nursery and other botanical gardens. There are also cultural performances and an elephant show. Bang Saray, a fishing village located 2km off the main highway at KM164, offers deep-sea fishing opportunities. Koh Lan, 45 minutes offshore by tourist boat or 15 minutes by speed boat, is the largest of Pattaya's archipelago. Major attractions include viewing coral reefs from glass-bottomed boats, snorkeling, scuba diving, wind-surfing, water-skiing and parasailing. There are a lot of seafood restaurants on the island's main beaches. Deep sea fishing can be arranged to Koh Lan"s neighboring islands such as Koh Khrok and Kho Sak. Byond Koh Lan is Koh Phai, an island currently under the care of the Royal Navy. Visitors are not allowed to stay here over night, but it has fine deserted beaches that are accessible during the day. All the nearby islands are easy to get to and charters can be arranged through travel agents, tour desks or by negotiating a price direct with the boat owners. Boat charters cost 1,000-5,000 Baht per day, depending on the season and size of the boat. Alcazar Show Pattaya 2nd Rd. Palladium Discotheque 78/33 Pattaya 2nd Rd. Aerobic Dance North Pattaya Rd. Bowling, Pattaya Bowl Pattaya 2nd Rd..
Thai Boxing Pattaya 2nd Rd. Aquanauts Diving 437/17 Soi 6, Beach Rd. � 2004 AllCAD Technologies Ltd.